I have been wanting to visit Varvakeios, the Central Market of Athens, for ages but although I live in Athens the last 22 years, I never managed to do so. Whenever I was at the area I was either in a hurry to do other shopping or a few times when I mentioned going inside, my daughter didn’t even want to hear about it. Shortly before Christmas, Marianna, of History of Greek Food, a Greek blogger, who deals with the history of food and the sociology of food consumption, posted about Varvakeios and when I said that I never visited it before, we arranged to get together in Athens so that we could get together, drink a cup of coffee and visit Varvakeios. We had arranged to meet at the Metro Station of Syntagma Square and walk our way up to Athinas Street, where Varvakeios, the Central – Municipal Market of Athens, is situated. However, you can get there from Monastiraki train and metro station, which is only five minutes’ walk from there or from Omonia train station, which is also five minutes’ walk away. Varvakeios has taken its name from its founder Ioannis Varvakis, who was a benefactor, born in the island of Psara and who donated the money for an Educational Institute for boys, soon after the Greek Independence in 1824.I found most of this information on the internet and it seems that some things never seem to change in Greece, as this school was burnt by a fire during the Dekemvriana in 1944.The building was demolished in 1956 and the area around the Central Market and the marketplace itself is known as Varvakeios. As I said, the Central Market, is situated in Athinas Street, (green line on map), not far away from the Municipal Town Hall and it is considered to be the most vivid part of the town. The rectangular building complex is a neoclassical building of the 19th century, built by architect, loannis Koumelis. It replaced an older market place of wooden sheds, that served as the main market place, during the Turkish occupation and which was burnt on 9 August 1884. The above collage of photos and historical information were taken from the site Archaeology of the City of Athens, and you may read more information here, as well. This complex, now houses the vegetable and fruit market, called Lahanagora, the Meat Market, called Kreatagora and the fish market, called Psaragora, selling all kinds of fresh fruit, meat and sea food, respectively. Its 73 shops apart from fish, fruit and meat, there are lots of little shops around the market area which sell all kinds of products, such as Greek cheeses, pastourmas, a highly seasoned, air-dried cured beef, salted dried cod, spices and other local products such as dried fruit, pastelli, loukoumia, nuts, etc. Other shops around the area sell household products, even household cleaning products. Loukoumia is a confection made with starch and syrup and mainly flavoured with rosewater, mastic and lemon but the variety they make in Cyprus is endless, so you can get flavours like banana, mint, chocolate, coconut, bergamot, mandarine, orange, pineapple, triantafyllo (rose), strawberry, vanilla etc. They take their name from the Arabic words luqma(t) plural luqūm, (lokma and lokum) which means morsel or mouthful because as you can see these are shaped into small morcels covered with icing sugar. I did not buy loukoumia because I make them myself, having a citrus flavour. The recipe is included in my cookbook Mint, Cinnamon & Blossom Water, Flavours of Cyprus, Kopiaste! People from all over Athens come here from the crack of dawn to get the freshest of the products sold and it is no wonder why during the holiday period of Christmas and Easter it is invaded by the reporters who try to find out where the prices will range. The traffic of people in Varvakeios never stops day and night and this is not a figure of speech as inside Varvakeios there are also many small eateries where they serve homemade food and roasted meat and fish, served with traditional Greek wine, retsina, which is a resinated white wine, and is a pole of attraction for many Athenians, especially after midnight hours. We visited the fish market, which was packed with people and could hardly walk around and it was kind of dark inside as the weather was cloudy and rainy that day, so I took a few pictures and left as Marianna wanted to show me other, unknown to me, parts of Athens, so we headed towards Evripidou Street, where all the spice shops are. It was like being in paradise. We stopped in a few of these spice shops and we both bought a few things, some of which cannot be found in neighbourhood supermarkets. I bought star anise, harissa pepper, lavender and thyme for myself and could not resist buying pastelli and Spatholado, from Kea. Spatholado, is an ancient remedy oil known to the Greeks and the Crusaders for it’s healing properties. Spatholado means sword-oil because it was used to heal sword wounds. It also works on burns, surgical scars and is especially effective on deep wounds. Near Varvakeios at Athinas Street but also in small roads around Athinas Street, you will find lots of shops selling all sorts of household items. I promised myself to go back another day, when I will have more time to look around for other interesting things to buy. Marianna then took me to a small Egyptian shop selling all kinds of products imported from Egypt and entering the shop the smell of soumac penetrated our noses. We avoided buying fresh products as the products were exposed to some flies but I was excited to find pomegranate molasses, Cypriot pita and falafel. 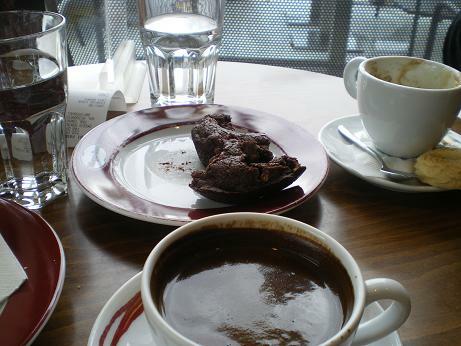 Time was passing quickly and we needed to sit and rest drinking a cup of coffee. Marianna took me to a big department store thereby, where on the top floor there is a cafeteria with a panoramic view of the city, including the Parthenon and Lycabettus but unfortunately I did not take any photos as I said before it was cloudy and rainy and the atmosphere was not appropriate to take any pictures. We had a lovely chat, talking about what else other than food and promised to meet again later in Spring with better weather and finding more interesting places at Thisseion this time. The selphie was taken by Marianna who just turned the camera towards us and clicked!! We had such a great time. Thank you Marianna and I am looking forward to the next time. I used the harissa pepper to make Tyrokafteri, a Greek dip made with hot peppers and cheese. What a nice experience…to visit a food and spice market and to a sister foodie! It’s always fun to be visitor in our own place. We actually never see the things near to us thinking we are here only know we can go and see it someother time. But never get enough time to be there…. What a great day! I walked past that building when I visited Greece with my High school class back in 1996… Nice stalls and products! Next time we’ll visit the Indian and Persian food shops! I love the market tour. The fish must be so fresh! Sounds like a lovely afternoon. Looks like both of you had a wonderful time in the market and you indeed have bought lot og goddies. Thanks for sharing the day, meetings like this are usually positive and I’m glad you made it to Varvakeios. This is like Disney for foodies! How nice to spend time with a fellow blogger! The spice shop looks fabulous!! Was it the top floor of Hondos Center that oyu enjoyed your kafedes? I’m pretty sure that is where you sat as I’ve been there many a time–my daughter loves the book shop and I enjoy sitting in the cafeteria and looking out. My in-laws who live in Athens had no idea it existed until I visited them for the first time with my daughter in 2005 and took my mother in law to the top floor so we can browse the bookstore. She couldn’t believe she’d never known it was there. I took my husband two years ago as well and he enjoyed the view as well. I try to go every time I am in Athens. P.S. It seems I must make it a point to visit Varvakeis this summer as I have never been there either. Thanks everybody for your lovely comments. If any one of you is coming to Athens, I shall be glad to show you around. Right Ben? Marianna, I Shall be looking forward to visiting the Indian and Persian food stores. Maria, actually it wasn’t Hondos Centre. We went to Notos Galleries near the Municipal Town Hall, but not the one near Stadiou. Awe Ivy it sounds like you had a terrific time! Next time you go we want to see more pictures!! You know I would have loved to be with the two of you Sis to share a cup of iced coffee and explore every inch of the Central Market. I missed the market when I was in Athens. For one thing I got lost and secondly the friend I was with was not feeling well. I am really looking forward to the pastelli and the Spatholado from my friends on Kea at Red Tractor Farms. I am so appreciative that you thought of me. Thank you so much:D Enjoy your holiday on Cyprus as well…you deserve it!!!! What a wonderful tour. Would love to do it someday too. I worked on Kos for a couple of months a few years back, but never made it to the mainland. And next a tour of Cyprus, or a t least a bit of it? What a fun day, Ivy! I enjoyed reading about it and seeing your pictures. Glad you’re having a great time Ivy – thanks for posting these lovely pics! I think that’s the market I went to when I was in Athens in 1997! I bought myself a beautiful flower vase – it’s blue and turquoise! Very vibrant. Looks like you had a lovely time – I can almost smell those herbs you were talking about. Pixen, unfortunately we did not go at the fruit market and the other places you mention but next time I’ll go over there as well. I wish I could’ve been there too! How wonderful! I am coming to Athens in June and this sounds like the place I want to be! As a fellow food blogger I love the adventure of finding markets and all their treasures! Thank you for sharing this one! The central market is amazing. You can find everything here: fruits, meat, vegetables seafood.. everything.